Sheet metal is a critical component of most mechanical systems. Hardy can provide and install sheet metal products for a wide range of mechanical applications. 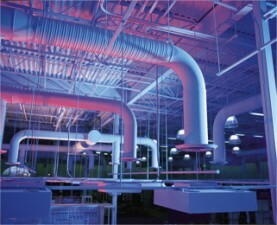 With our in house 30,000 SF fabrication facility, we can streamline the process to reduce project costs. Our team of installers has a long standing track record of being the best in the business. Experienced sheet metal mechanics are a key component to our successful approach; providing our client a quality installation, on time and under budget.